Having fresh baked bread right at home can be both comforting and delicious, but time consuming to make on a regular basis. Bread makers take the complicated steps and the mess out of the baking process. 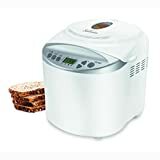 If you want homemade bread with the ease of just adding the ingredients and pressing some buttons, then this buying guide will help you choose the best automatic bread maker for you. 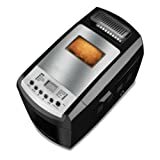 Programmable Bread Makers: Programmable bread makers allow the user to set bread to bake up to 13 hours in advance. These machines are handy if you want to set the timer at night and have fresh bread ready by the time you wake up. You can also prepare all the ingredients for the bread dough and perfectly time the baking process to be ready when you want it. There are also warming features to keep the bread fresh and hot. Vertical Bread Makers: Originally, bread makers only had vertical orientation. The loaves come out tall and square-shaped, and vertical bread makers have one kneading blade. These bread makers are still available today, although they are less common. 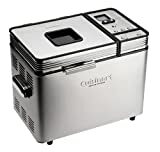 Horizontal Bread Makers: Newer bread makers are made with horizontal orientation. The loaves are longer, more rectangular, and look more like the bread you might buy in a bakery. These bread makers have two kneading blades usually. Customizable settings: Bread makers can have all kinds of customizable settings for specialty recipes and ingredients. Consumers were most satisfied with their bread makers when they chose just the settings they actually needed. Preheating: Consumers prefer bread makers with faster preheat times for ease and convenience. Different bread makers have different preheating and warming settings so comparing your top choices will ensure you get the right specs for you. 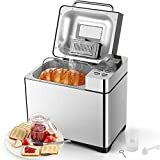 Easy to clean: Bread makers that have nonstick bread pans that slide out easily, and removable kneading paddles for quick and easy cleanup after baking, are rated much higher than other bread makers. Consumers consistently prefer the bread makers with the most convenience and easy cleaning capacity. Versatility: Consumers find that bread makers with a variety of uses were staples in their kitchens. Many of the top brands have settings for making more than just bread--such as pizza crust, jam, and pasta dough, and these are very popular. They also have “knead-only” settings so you can save the dough for later or make it in the oven. This feature will add much more versatility to your bread maker . Your bread maker should come with the basic white bread and knead-only settings. The price of bread makers will depend on the more advanced settings they have. You don’t need the most expensive bread maker to get a good loaf of bread, so choose based on the settings you’ll get the most use out of, and skip the settings you think you won’t need. Bread makers come in different loaf sizes from 1 to 2.5 lbs., so think about how much bread you intend to make. A 1 lb. loaf can feed a family of four for a few days. A large 2-2.5 lb. loaf won’t stay fresh for longer than a few days unless you’re baking for more people. Some bread makers also have adjustable loaf sizes for those special occasions when you are feeding a larger crowd. Look for bread makers with at least a 1-year warranty. It speaks to the quality of the bread maker if the manufacturer believes in the longevity of the appliance. 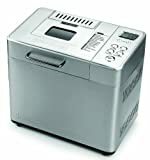 Some bread makers have ingredient dispensers to add ingredients later in the baking process. This is helpful for adding dried fruits or nuts and allows for more precise measurements when adding yeast to the dough. Make sure if you are buying a horizontal bread maker that it has two kneading blades. This will ensure even, consistent kneading of the dough and a better loaf of bread. Some bread makers have different crust settings. If light, medium, or dark crusts are important to you and your baking needs, then take this setting into account when choosing a bread maker. 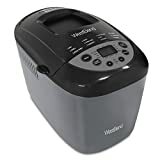 If you need convection settings for things you make on a regular basis, then choose a bread maker with convection settings. Many bread makers offer this feature and it can also be helpful for achieving a crisp crust. These models are usually more high quality as well. Zojirushi: Founded in 1918 in Osaka, Japan, Zojirushi is a corporation that specializes in cooking products. They use their advanced technology to make household products, including kitchen appliances, that are consistently top-rated. Panasonic: Panasonic has been an innovator in home and business technologies in North America for over 50 years. Panasonic products include audio and video equipment, home appliances, televisions, cameras, kitchen appliances and more. Oster: Oster began in 1924 as a barber equipment manufacturer and has been making small household appliances since 1946. 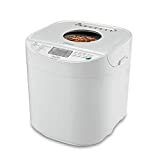 Today, they manufacture a vast array of electrical appliances that boast easy to use features and quality cooking products, like their line of bread makers. Breville: Breville is an Australian small household appliance brand that was founded in 1932. 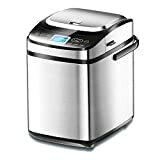 The company created the original sandwich maker and has been an influential manufacturer and marketer of household kitchen appliances since. Their Custom Loaf bread maker features and automatic fruit and nut dispenser.